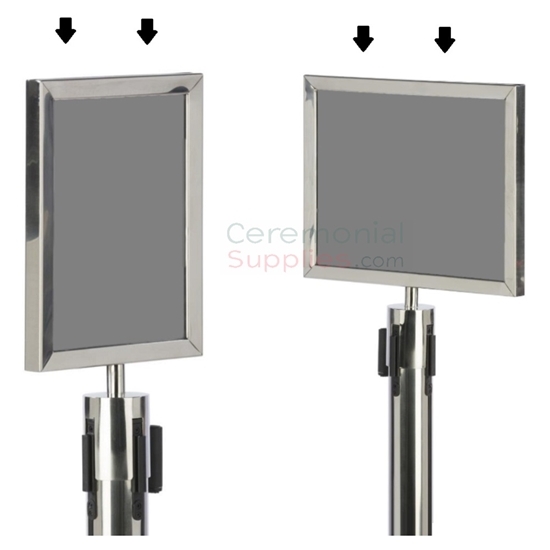 Stanchion Sign Frames are extremely useful in guiding crowds upon entering a large scale venue. This sign frame features a shiny chrome finish and clear acrylic protective lenses. It stands out to attendees, providing information or direction while still maintaining the high class aura of the event. The attachment cup has 4 slots that locks into our 4-way stanchion adapter top allowing you to attach this sign frame into our matching Chrome retractable stanchions. Attach to a queue pole as a stand alone or connect our stanchion rope with matching chrome hook ends to configure crowd lines.